Travel with us to our “foodie” destinations in Limousin, the still little known region of France. While creating our itineraries we will try to make everything as easy as possible for you. We will meet you at Limoges or Brive Vallée de la Dordogne airports, or Limoges train station and will return you to the airport/station at the end of the week. Once you are with us there’s no need to worry about parking, tickets, or reservations – we will take care of everything for you. You will stay 4 nights at La Croix du Reh full board with breakfast, lunch and dinner included. 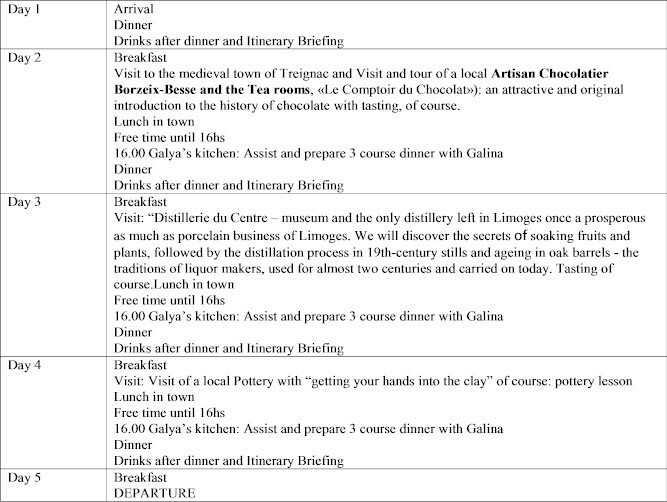 Here is just an example of the itinerary. The visits can vary depending on season, day of the week and your preference. For more information please contact us. Here is just an example of itinerary. The visits can vary depending on season and day of the week. 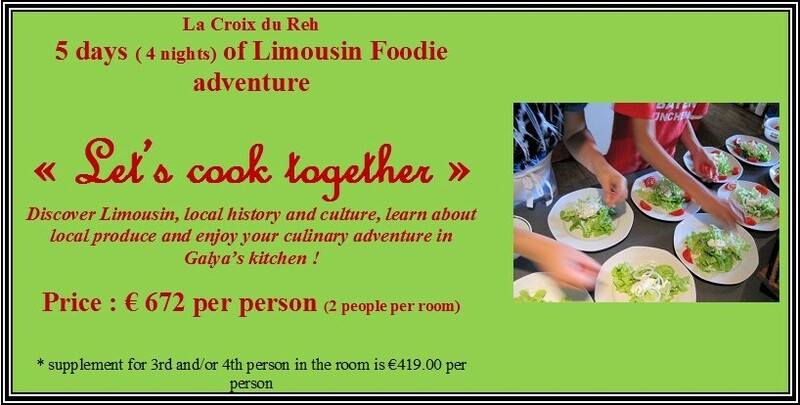 If you would like to learn something new, to explore splendid unknown Limousin region, meet local producers and like to cook (or just eat), then this may be the perfect holiday adventure for you. Check out our Foodie Adventure availability calendar or simply send us an e-mail enquiry. The house and the park are beautiful, the food products and marchés are incredible, the countryside is breathtaking, and the cooking workshops are fun. We hope to see you on the next Limousin Foodie Adventure! One Response to Your “foodie” adventure in Limousin. Reblogged this on Galya's Kitchen.